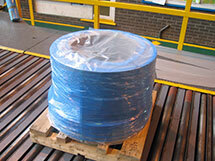 VCI stretch films are manufactured in thickness from as little as 15mu. The films cover both hand and machine applications. They can also be printed in up to 4 colours and can be made with a large range of polymers providing characteristics that suit the particular application in hand. Our Technical staff can visit to determine which quality of film will be most suitable for your application. ​To obtain a Product Data sheet please go to the Literature Fulfilment section.